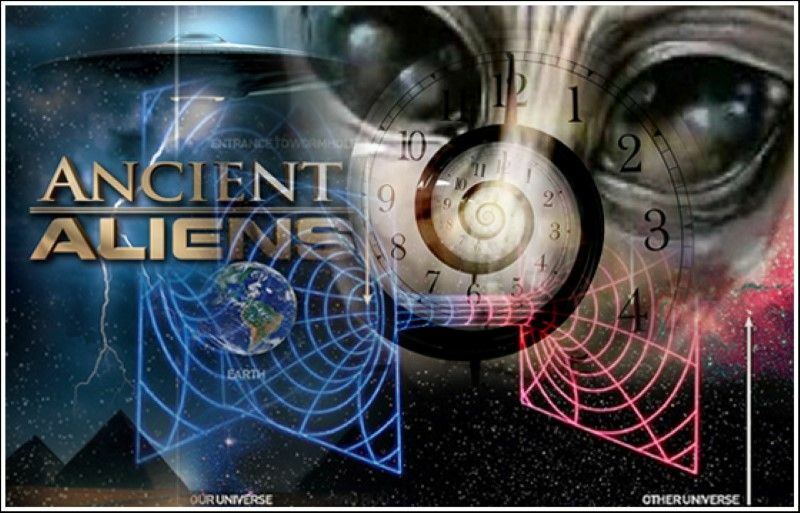 Home » Are Ancient Aliens Really Futuristic Human Time Travelers? I recently had the chance to sit down with Marie D. Jones, author of This Book Is From the Future and Viral Mythology to discuss the possibility of human time travel and the possible link to the ancient alien theory. The growing popularity of the History Channel series, Ancient Aliens has led to some interesting speculations about what, or who, may have once visited our ancestors, imparting knowledge and technological advancement that lead to leaps and bounds in human development. Originally, the concept of ancient aliens, or ancient astronauts, pointed to extraterrestrial intervention occurring thousands of years ago, and possibly even a little genetic intervention as well. The ancient astronaut theory posits that our ancestors experienced these huge leaps forward in advancement of scientific, astronomical, technological and medical knowledge that could simply NOT have happened on their own. We MUST have had some help from above, from entities far more intelligent and evolved than we. Otherwise, how could we have built those amazing Egyptian pyramids and erected those massive stone statues on Easter Island, or the meticulously intricate blocks that make up Puma Punku in Bolivia… and what of the many glyphs, cave and rock paintings, carvings, drawings and statuettes from our distant past that appear to portray “helmeted” figures that do not look quite human, or those of strange craft whizzing by in the sky? Are all these “archeo-enigmas” proof that our ancestors mingled with the star people, and left us clues in their art,architecture, myths and religious texts? While many argue that there is no proof we humans needed a little help from above to make those huge jumps forward in our evolution, there are many who insist that the archeological evidence is clear… we were once hanging out with aliens, maybe even breeding with them, or having their DNA spliced into our own, possibly against our knowledge or will. The theory also posits that these aliens were from advanced civilizations, coming to visit lowly human Earthlings and impart what they knew of the vast cosmos and all possibilities therein. Speculation includes locations both within and outside of our known universe, where the laws of physics might allow for travel between worlds. But… what about travel between times? If we entertain the ancient astronaut theory, and there is compelling “circumstantial evidence” to give it serious thought, must we accept that the aliens that intervened were indeed aliens at all? Might they have been… dare I say… US? Humans of the future, coming back to teach, warn and guide the humans of the past? Lest you think that a ridiculously unfounded statement, let me bring up an interesting subject. In the summer of 1947, a mysterious object crashed on a ranch in the desert near Roswell, New Mexico, creating a firestorm of ongoing controversy. Original news stories claimed it a flying saucer, but were immediately suppressed in favor of a weather balloon story courtesy of the authorities… the classic cover-up. Roswell is now the stuff of legends, as well as movies, TV shows, books by the dozen and continued debate and discussion as to exactly what happened on that fateful date in history. Were alien bodies discovered at the crash site, as many claim, and whisked away to a top-secret hangar at Wright-Patterson AFB? Was the craft later back-engineered at the notorious Area 51 in Nevada? Was there an alien autopsy done on the crash victims, as claimed by a TV show years ago? We still really don’t know what happened at Roswell, but there is an ancient alien/astronaut link that adds to the mystery. According to a renowned U.S. Navy Commander named George W. Hoover, the aliens may have been human beings from the future… us… come back to, well, interact with… us. Allegedly, Hoover had top-secret clearance as part of his work as a Naval Intelligence Officer to view the Roswell debris and bodies during the 1950s…and he eventually told a very select group of people before his death of his beliefs. Those people included his own son, George Hoover, Jr. and later ufologist and researcher William J. Birnes, both of whom were made privy to what the elder Hoover knew before his death. Hoover stated during interviews that he believed the aliens were not extraterrestrial but were extratemporal — as in time travelers. In addition, he believed they were not really aliens at all… but humans of the future, with incredible abilities to use the power of consciousness to morph reality and travel through the landscape of time. Hoover’s story mirrors other stories from some ufologists and many UFO abductees that aliens may have been, and still may be, humans of the future who have found the technology to overcome the limitations of light speed and time travel paradoxes that keep present day humans from breaching the boundaries of time. Their often-humanoid appearance may suggest a link between the way we look today, and what we might look like thousands of years from now. Ancient aliens may, in fact, be future humans. It’s a mind-bending idea, but not an entirely impossible one.